ANAHEIM, Calif. (NRB) – Submission to Christ is the “only hope” for a world in rebellion against God, pastor H.B. 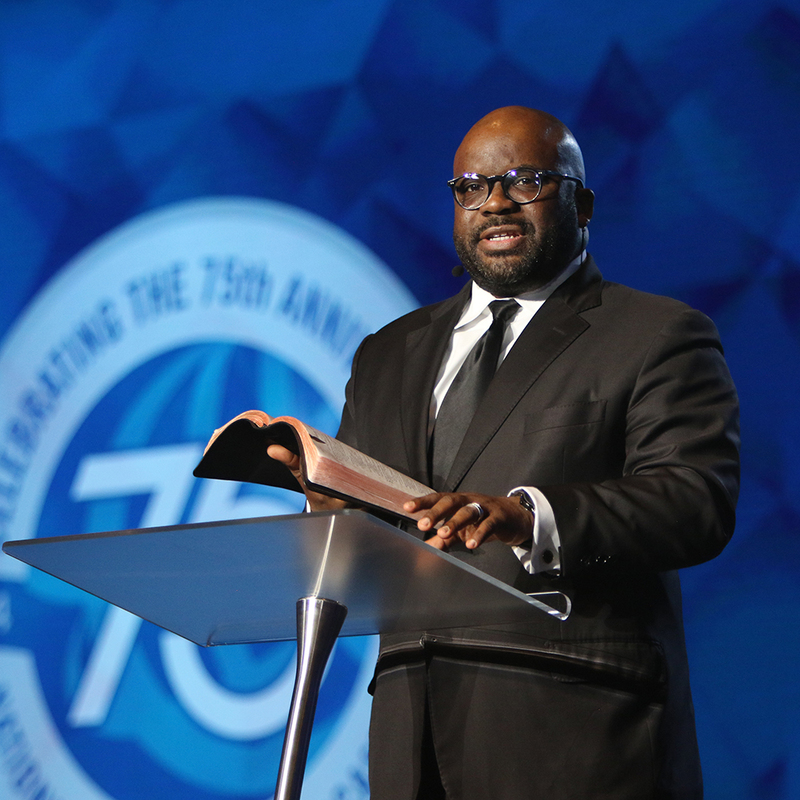 Charles Jr. said during a March 28 worship service at Proclaim 19, the National Religious Broadcasters’ International Christian Media Convention. Charles, pastor-teacher at Shiloh Metropolitan Baptist Church of Jacksonville and Orange Park, Florida, preached on Psalm 2 during a service that featured a hymn sing led by Bob Lepine, co-host of the radio program FamilyLife Today. After describing mankind’s rebellion and God’s response, Psalm 2 presents Jesus’ authority and the need to serve Him, Charles said. “The only hope for rebellious mankind is this Christ we proclaim by the means that God has given us,” he said before explaining the good news of the Gospel. “The bad news is we are sinners and our sin separates us from God,” Charles said. “The worst news is that there is nothing we can do to fix what our sin has messed up. But the good news is God sent His Son Jesus to die at the cross to pay for our sin and [He] rose from the dead for our justification. And the best news is if a sinner runs to the cross tonight and trusts in Jesus you can have free forgiveness, new life, and eternal hope tonight. The directive to “rejoice with trembling” is “one of the most succinct definitions of worship in Scripture,” he said. “When we worship God together, it shouldn’t be like a funeral or sitting in the doctor’s office or being stuck in traffic. We should rejoice. Psalm 2 next describes God’s response, which is to laugh at mankind’s rebellion, Charles said. “Human rebellion is divine comedy,” he said. “When God laughs, it’s not funny. God is not laughing with us; He is laughing at us. John MacArthur was originally scheduled to preach but was diagnosed with a throat infection requiring him to clear his schedule of preaching, speaking, and recording responsibilities. Joni Eareckson Tada was to lead the hymn sing during the worship service but was hospitalized the day before. She had been suffering with breathing difficulty and pain in the weeks after a series of radiation treatments for a recurrence of cancer. 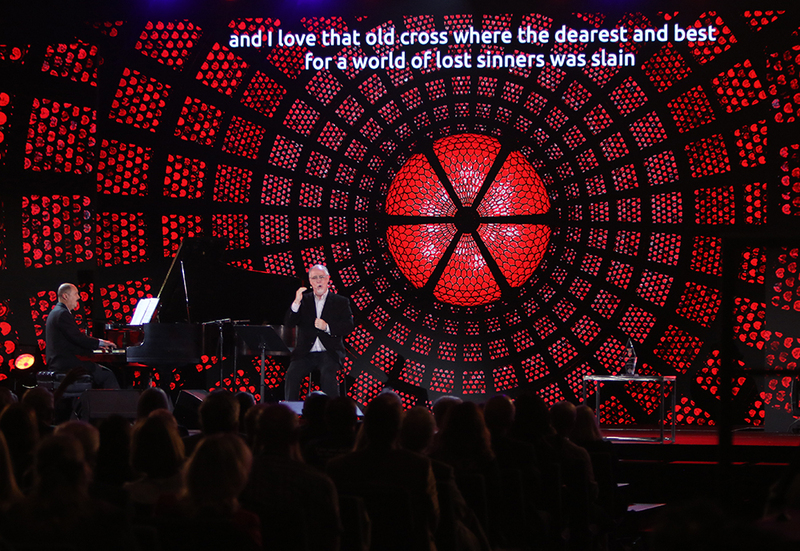 Lepine, also senior vice president of FamilyLife, led the gathering through a series of mostly old hymns accompanied by Mark Rice, pianist with Grace Community Church in Sun Valley, California, where MacArthur is pastor-teacher. That will be “the testimony in Heaven for people who struggle today with challenges physically, and, of course, that’s Joni’s situation,” Lepine told the gathering. Tada, one of the world’s leading international advocates for people affected by disability, has been quadriplegic in a wheelchair since a diving accident in 1967, when she was 17. An offering was received during the worship service for two projects being undertaken by the Far East Broadcasting Company – building an FM radio station to reach the North Korean capital, Pyongyang, and a 250,000-watt AM station to blanket all of North Korea 24 hours a day, seven days a week. The sponsor of the service was Bott Radio Network.